Do you ever feel bombarded with information on workouts, healthy eating, and getting enough sleep? I do, and this ideal can often lead to unrealistic expectations! Relax, sometimes despite our best efforts, those late nights and takeouts add up (on our waistline) even when we have the best of intentions! Thankfully thanks to modern science Bijoux Medispa provides the opportunity for men to tackle stubborn pockets of fat head on, with their Coolsculpt treatment. 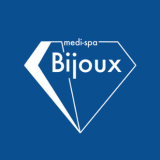 Bijoux Medispa has long been is my destination of choice when it comes to certain face treatments. It’s quite clear, that they are also at the top of their game when it comes to tackling out of shape MALE bodies! So how does it work? Injections? Surgery? None of the above! Actually Coolsculpt really is the coolest body treatment around, because it can freeze away stubborn body fat in a non-invasive procedure. By using the Coolsculpt Device, fat cells are targeted and killed with such precision that the rest of your body is left untouched. It is important to be aware of the current rash of imitators, or copy cat treatments. This FDA-approved procedure at Bijoux Medispa is the original and the best treatment of its type. 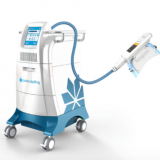 The Coolsculpt procedure consists of a suction pad being placed over the treatment area and attached to the Coolsculpt machine. The targeted area is then frozen until solid, and in order to break up the frozen fat cells the area is then massaged post treatment. The intensity of this massage kick starts the process of dispersing the fat cells. Are you wondering what it felt like? Well, post-treatment the targeted area only felt slightly tender, discomfort was minimal, and I headed straight back to work..so hey presto absolutely no down time! 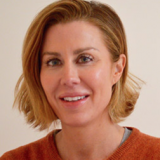 Results from my treatment didn’t occur overnight, as the science behind the procedure means that the targeted fat cells take time to die and be metabolised away from the area naturally by your body. Differences become noticeable after just a few short weeks and continue to develop in the following couple of months until the maximum effect was reached. The final results were very visible and surpassed my expectations. There may be no such thing as a quick fix when it comes to bodies, but this treatment comes as near as damn it! Thanks Bijoux Medispa, I’ll be back. It’s true what they say, good things really do come to come to those who wait. 2. Jit Tobin - Massage Therapist. 3. 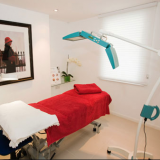 Minimal and male Friendly Treatment Room at Bijoux Medispa. 4. 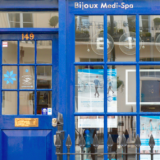 Exterior of Bijoux Medispa. 5. 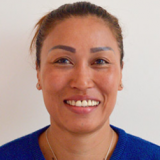 Faye Parker - Laser and Light Based Treatment Therapist. 7. 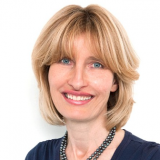 Clinic Founder - Dr Elisabeth Dancey MB BCAM. 8. Nick Cox, Editor, The Grooming Guide.